Retired detective owner of Sweep-A-Lot is detail-oriented. Rick McCann retired as a senior detective in Augusta, Georgia. He transferred the level of professionalism that job required to the sweeping and maintenance company he formed. Rick McCann spent 25 years in law enforcement, where he ultimately oversaw Augusta/Richmond County's violent crimes division. Upon retirement he spent several years working at a local bank where he was in charge of facilities, security, ATMs, and telecommunications. Alice is a retired schoolteacher. As a team, they recognize the value of being both detail-oriented and thorough in providing services to customers. They brought this philosopy of excellence to their own company when founding Sweep-A-Lot, Inc. in 2004. The company foundation is to always deliver on any agreements with our customers. "If we say we'll be on your parking lot at a given time to handle a project," says Rick, "we're there, rain, heat, snow or whatever else might occur." Although Rick heads up the company, the rest of his immediate family is 'hands-on' in day-to-day operations, as well. All have the same commitment to quality work output, and these values are instilled in the entire Sweep-A-Lot workforce through its training program. "We have a number of remote property managers who count on us to be their link to their properties," says McCann. "When something goes wrong, like it did the other day on a property where a water leak flooded the gravel parking lot in the back, I'm who gets a call. My property management customers know they can count on my assessment of the situation -- whatever it might be -- and recommend the actions needed. Although often we can handle what needs to be done, there are other times we can't. Even then, our commitment is to stay involved to make sure repairs are done correctly." Sweep-A-Lot is truly a family organization, involving not only Rick and Alice but their two sons, Scott and Taylor, as well. All have been infused with the company-wide commitment to be a notch better than anyone else in their marketplace. "We don't nickel and dime our customers on the little things we believe should be part of good service," McCann continues. 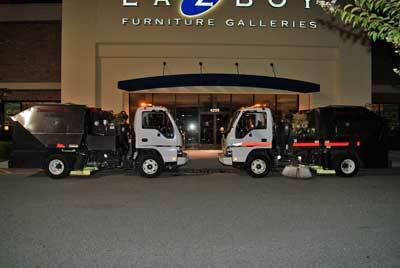 "For example, once-a-week we conduct a free lighting check for our sweeping customers. We're the ones who are on the parking lot at night, so we believe that's a responsibility that best falls to our company. By notifying customers promptly about burnt-out lights, and anything else that's out of place, they have the best opportunity to get the problem solved before there is an accident or other liability occurs. In today's business climate, that's enormously important." In the audio interview, linked below, McCann discusses how he got into the power sweeping business and the company philosophy that sets Sweep-A-Lot apart from its competitors. Note: The following audio interview with Rick McCann, which is approximately 18 minutes in length, will play without downloading any files onto your computer. If you hear the interview at 'chipmunk speed,' you will need to download the latest version of Adobe's free Flash player. The company may be reached via email, or by calling them at 706.284.2243. The company's website is www.sweepalot.biz/.